& Bethany Cosentino, 50 Cent, 9th Wonder, Agnes, Alicia Keys, Alkaline Trio, Allie Moss, Aloe Blacc, AM, American Bang, Amerie, Ana Tijoux, And Inspectah Deck, And Rae, And Raekwon, Andre 3000, Andy Allo, Annie Lennox, Arcade Fire, Archie Bronson Outfit, Audrey Assad, Avenida 6, Avi Buffalo, B.o.B, Band Of Horses, Banda de Turistas, Basia Bulat, Battles, Beach House, Beastie Boys, Beck and Bat For Lashes, Beckah Shae, Bee Gees, Belle & Sebastian feat. Norah Jones, Best Coast, Big Boi, Bilal, Billy Lamont, Black Eyed Peas, Black Rebel Motorcycle Club, Blackstar, Blakroc, Blu, Bob & Gene, Bobby Vidales, Bombay Bicycle Club, Brad, Brendan James, Bring Me the Horizon, Broken Bells, Broken Social Scene, Busta Rhymes, Cam'ron & Vado, Capone-N-Noreaga, Caribou, Ceci Bastida, Cee Lo, Cee-Lo Green, ceo, Charlie Hunter feat. Norah Jones, Chasen, Cherryholmes, Child Rebel Soldier, Chino & Nacho, ChocQuibTown, Chris Brown, Christopher von Uckermann, Ciara, Citizen Cope, Clipse, Clorofila, Common, Consequence, Corinne Bailey Rae, Cory Morrow, Court Yard Hounds, Currensy, Cypress Hill, Daft Punk, Daniel Hope, Dapuntobeat, Dave Barnes, David Banner, David Banner and 9th Wonder, Dead Prez, Delta Spirit, Destinee & Paris, Diddy, Diddy-Dirty Money, Dierks Bentley, Diggy, Dirty Dozen Brass Band feat. Norah Jones, Dirty Little Rabbits, Dirty Money, DJ Center, DJ Kay Slay, DJ Mathematics Presents Meth Ghost Rae, DJ Muggs VS Ill Bill, Don Covay, Dondria, Dr Dre Ft Eminem, Dr. Dre, Dr. Dre Ft Snoop Dogg & Akon, Drag-On, Drake, Duffy, Duran Duran, Eastern Conference Champions, Eddie Vedder, El Madmo, Elton John & Leon Russell, Emika, Eminem, Eminem & Royce Da 5'9, Erykah Badu, Estelle, Fabolous, Fanfarlo, Far East Movement, Fefe Dobson, Feist, Field Music, First Aid Kit, Florence and The Machine, Foo Fighters feat. Norah Jones, Four Tet, Fran Healy, Frank Howard & The Commanders, Frazey Ford, Freeway, Frightened Rabbit, GBH, Gerardo Ortíz, Ghost, Ghostface, Ghostface Killah, GLC, Goapele, Goldfrapp, Good Old War, Goodie Mob, Gorillaz, Greg Laswell, Gurrumul, GZA, Herbie Hancock feat. Norah Jones, Hey Monday, Holly Miranda, Hot Chip, House of Heroes, Howard Shore, Inspectah Deck, Iration, Iskander, Iyaz, J King y Maximan, J. Holiday, Jack Johnson, Jadakiss, Jakob Dylan, Janelle Monae, Jay Electronica, Jay-Z, Jazmine Sullivan, Jónsi, Jeremih, Jimi Hendrix, Jimmy Norman, Jonathan Cohen, Jorge Drexler, Josh Groban, Josh Ritter, Josh Rouse, Joss Stone, Jukebox the Ghost, Julieta Venegas, Junip, JYJ, Kanye West, Kanye West & Jay-Z, Karina Pasian, Keith Murray, Kelis, Keri Hilson, KiD CuDi, Kidz In The Hall, King Curtis, Kings of Leon, Kristian Bezuidenhout, KRS-One & True Master, La Roux, Lady GaGa, Laura Veirs, Lee Fields, Leela James, Lil Wayne, Linkin Park, Little Brother, Little Richard, Local Natives, Lorenza Borrani, Los Claxons, Los Lobos, Love Star, Ludacris, Lupe Fiasco, Luz Rios, Lylit, M.I.A., Macy Gray, Major Lazer, Major Lazer & La Roux, Maldita Vecindad, Mariah Carey, Massive Attack, Masta Killa, Mavis Staples, Maximum Balloon, Mêlée, Medina Green, Menahan Street Band, Meth, Method Man, Metric, Michael Jackson, Michoacan, Miguel, Millionyoung, MiMi, Minus the Bear, Monica, Mos Def, Mr. Hudson, Murs & 9th Wonder, Muse, N.E.R.D., N.O.R.E., Naomi Davis & Sugarman Three, Naomi Shelton & The Gospel Queens, Nas, Neon Trees, New Politics, Nicki Minaj, Nneka, Norah Jones & Sasha Dobson, Norah Jones feat. Dolly Parton, Norah Jones feat. Gillian Welch & David Rawlings, Norah Jones feat. M. Ward, Omarion, Our Last Night, OutKast feat. Norah Jones, Ozomatli, Panoptica Orchestra, Papoose, Patty Griffin, Paty Cantu, Peter Silberman of the Antlers, Pharrell, Philip Selway, Pink Martini, Plain White T's, Plants and Animals, Polock, Public Enemy, Q-Tip, Q-Tip feat. Norah Jones, Raekwon, Ray Charles feat. Norah Jones, Ray Sharpe, Red Cafe, Redman, Reflection Eternal, Rich Hil Ft Kid Cudi, Richard Galliano, Rick Ross, Rihanna, Robert Plant, Robin Thicke, Rogue Wave, Rosa Lee Brooks, Rostam Batmanglij, Ryan Adams feat. 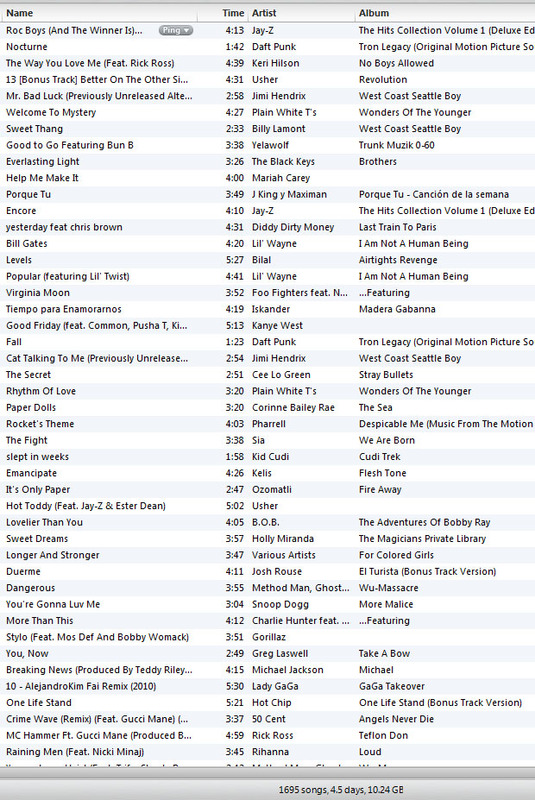 Norah Jones, RZA, Sade, Sarah McLachlan, Scissor Sisters, Seabear, Sean Bones feat. Norah Jones, Sean Price, Semi Precious Weapons, Senator & The New Republic, Shanell, Sharon Jones & The Dap-Kings, Shout Out Louds, Sia, Skillz, Sky Sailing, Slash, Sleigh Bells, Snoop Dogg, Stacy Clark, Stefan Maass, Stefan Rath & Hans-Kristian Kjos Sorensen, Stuttgarter Kammerorchester & Karl Münchinger, Sugarman Three, Superlitio, Surfer Blood, Swedish House Mafia, T.I., Talent Couture, Talib Kweli, Talib Kweli feat. Norah Jones, The Bamboos, The Band Perry, The Bird And The Bee, The Black Keys, The Bravery, The Budos Band, The Chieftains, The Constellations, The Cool Kids, The Daktaris, The Dead Weather, The Foreign Exchange, The Gracious Few, The Head and the Heart, The High Wire, The Icemen, The Isley Brothers, The Jones Sisters, The Little Willies, The Mighty Imperials, The Minions, The National, The Poets of Rhythm, The Rescues, The Roots, The Secret Sisters, The Soft Pack, The Sylvers, The Virginmarys, The Watson Twins, Theophilus London, Timbaland, Toro Y Moi, Travis Porter, Trent Reznor & Atticus Ross, Troy Olsen, Two Door Cinema Club, UNKLE, Usher, V.V. Brown, Vampire Weekend, Various Artists, Villagers, Vivian Green, Waka Flocka Flame, Wale, Willie Nelson feat. Norah Jones, Wintersleep, Wu Tang Vs The Beatles, Wye Oak, Yeasayer, Yelawolf, Yoav, Zac Brown Band, Zo! 2003, activist, Aftermath, alternative hip hop, Anthony Ian Berkeley, arranger, Bernardo Bertolucci, Beverly Hills, Blue Lines, Blue Lines Blog, BMG Records, Brothers Grym, California, Canada, Cancer, ceo, Electronica, Emcee, Empire Musicwerks, Esthero, experimental rock, Gee Street, Gravediggaz, Grym Reaper, Hip-Hop, Hip-Hop Quotable, Hip-Hop Quotable Wednesdays, Indie, Island, Jamal Gray, Jenny-Bea Englishman, Key Yemaya Walker, Long Island, lounge, Magic, music, Myth, New York, One Life, Ontario, Palace of the Pretender, Pennsylvania, Philadelphia, Poetic, PolyGram, Producer, R&B, Raptivism, Rawkus, record producer, Red Planet Music, Reprise, Singer/songwriter, Sony, Stratford, The Last Emperor, Too Poetic, Toronto, Trinidad and Tobago, trip hop, U.S., Universal Canada, V2, Warner Bros.
Fitting for a month dedicated to Cancer Awareness. This includes one of the last performances by Poetic (of Gravdiggaz) shortly before he succumbed to cancer. Does my body remain at rest like when I’m sleeping at night? Will I burn in eternal hell? Or will I find paradise? Is it like purgatory the story described by the Catholics? Is wheres my spirit go?